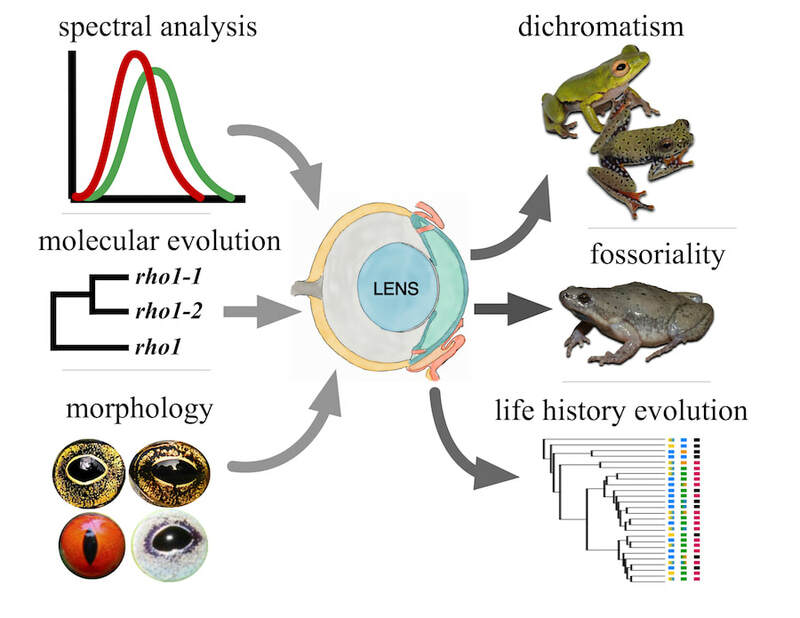 The goal of this project is to understand the physiological, genetic, and morphological trends of vision system evolution during evolutionary transitions throughout the frog tree of life. To first understand vision systems at a broad scale, this project will collect morphological and microspectrophotometry data across 27 families to generate a comprehensive appreciation of vision diversity and evolution in frogs. Molecular evolutionary studies will provide a genomic perspective on vision evolution with the expectation that visually-oriented frogs exhibit greater levels of natural selection, gene duplication, and retention of vision genes. Characterising the physiology and molecular underpinnings of vision in species with aquatic tadpoles and terrestrial adults will reveal how the visual system adapts to distinct visual environments during metamorphosis. These broad studies will provide a framework for more focused investigations that target transitions in sexual dichromatism and fossoriality. Using the hyperdiverse African reed frogs, this project will test whether the evolution of bright coloration and sexual dichromatism is associated with visual system diversity that maximises species recognition. Finally, this project will investigate how transitions to fossoriality shape the morphological and genetic components of visual systems in two predominantly fossorial families with the expectation that eye reduction accompanies a reduction in use or inactivation of vision genes. Our integrative approach will provide detailed and comprehensive insight into vision evolution across life history transitions in frogs and addresses a central gap in our overall understanding of vertebrate vision evolution.